Plenty of old and new to choose from. You owe it to yourself to try one of the new magazines or dig up an old book. This Jan-Feb groupread continues an annual tradition since at least 2014 (though many shared the topic of Anthologies with another). In the US? 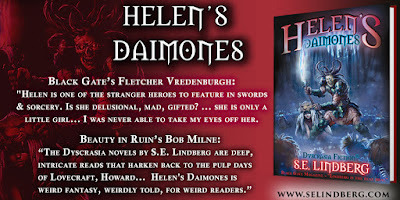 Enter to win 1 of 15 signed paperbacks of Helen's Daimones! 1) Cook's BLACK COMPANY Groupread Discussion . Glen Cook's Black Company.... with a keen eye toward Port of Shadows, the new episode due out Sept-11th 2019. All Black Company books are fair game. 2) KANE Group Discussion . It is always a good time to read Kane, but now we can do so with this group, and a fine podcast already in progress on The Dark Crusade Podcast. It is always a goo time to read Kane, but now we can do so with this group, and a fine podcast already in progress: This Summer/Fall 2019, Jordan Douglas Smith and F. N. York chat about a different story on the Dark Crusade Podcast. The Dark Crusade is a podcast dedicated to the fiction, life, and influences of writer, editor, and publisher Karl Edward Wagner.The goal is to read through the works of Wagner, learn more about him, and reignite interest in his work. Jul-Aug Groupreads: New vs. "N"
it's the New vs. the Old! Dungeon Masters Guide with cover art by David C. Sutherland III (1979) and containing the Appendix N.
Should you trust a talking skull? Well, no sane person would, but I attest this Skull does not lie. 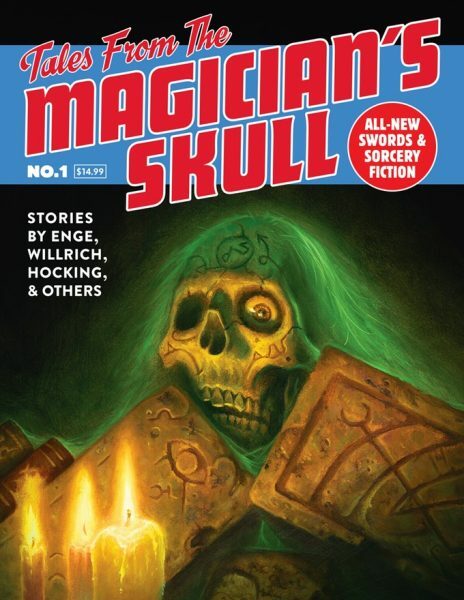 Tales from the Magician's Skull #1 spawned from a successful 2017 Kickstarter Campaign in which Howard Andrew Jones (Sword & Sorcery guru, author, and RPGer) teamed up with Joseph Goodman of Goodman Games, publisher of Dungeon Crawl Classics. The resulting magazine reflects this partnership, marrying great stories with suggested RPG game items. As a backer and enthusiast of fantasy fiction, I couldn’t be more pleased. QUALITY: The quality is great (the artwork, editing, illustrations, paper-feel etc. ); this magazine is just fun to hold. APPENDIX: The Appendix! What a great design idea! To drive home the RPG elements of the stories, these guys created items and rules related to each story for the Dungeon Crawl Classic RPG. This is really cool. read the stories...then go play them. ILLUSTRATIONS: Ooh, the illustrations are nice and varied. For Enge’s story, Russ Nicholson drew a full page, very reminiscent of his drawings for the Fighting Fantasy gamebooks. 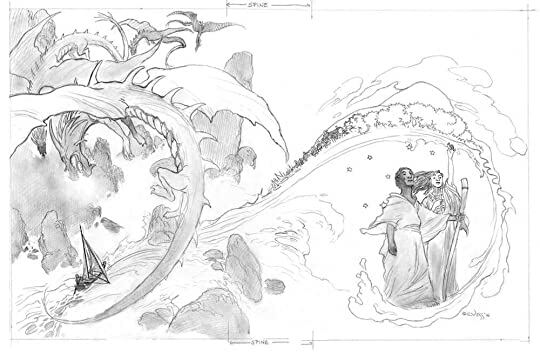 Many full page, detailed illustrations decorate the interior (by artists: Jennell Jaquays, Doug Kovacs, William McAusland, Brad McDevitt, Ian Miller, Russ Nicholson, Stefan Poag, and Chuck Whelon). 1) "What Lies in Ice" A Gaunt and Bone story by Chris Willrich - For me this was 3-stars, but I think YA-adult and lit-RPG (literary RPG) readers will enjoy it more. For a short story, this has a huge party of protagonists (>6), heavy doses of comic relief, and an overabundance of fast-paced story telling that shoots for ADHD action scenes rather than elements-that-build-on-each other. It reminds me of a Marvel Avengers movie. It has too much in it to allow an old fogie like myself enough to grasp on to, but it does have a lot of neat things going on (as disjointed as they are). My favorite concept/creature: Hands of the Sea (which is the first item in the Appendix!). Sharing my thoughts on Goodreads prompted the Sword & Sorcery crowd assured me that followers of Gaunt and Bone will enjoy this since it ties together other G&B yarns. 2) James Enge's "The Guild of Silent Men : A Story of Morlock Ambrosius". 5-star! 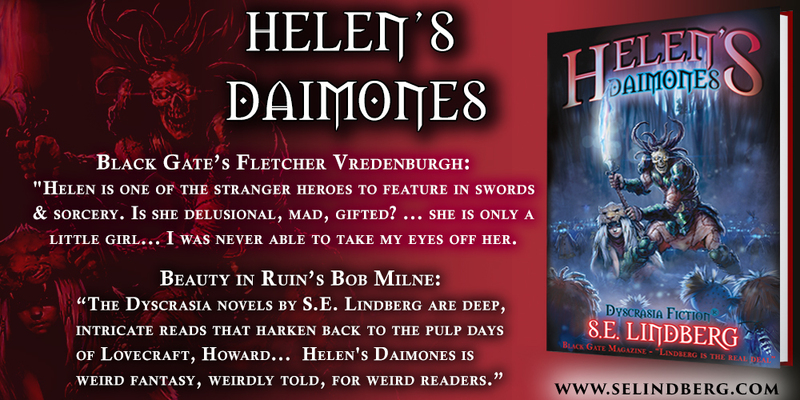 Although less action than the previous story, this fantasy-murder mystery delivers more than enough swords-n-sorcery while fleshing out Thain Morlock's background and motivations. A fun read that also serves to make me want to learn more. Perhaps I should go get Blood of Ambrose right now. Mightier than the Sword and Last of His Kind). This Asian/Orient adventure is led by an entertaining duo tracking a drug trade (of Black Pearls, being mysterious narcotics) from the Fish-Gutter gang. Death escapes the protagonists more than it should, but the story is great. 4) Aeryn Rudel's “Beyond the Block” - 5 stars. A first-person perspective was perfect for this undead horror. Another duo stars, this time its Lucinda and her brother Matthais (the narrator). Matthais is a blacksmith who seeks to defend Lucinda from Lord Magister Vyard (a sorcerer who wants something of Lucinda’s magical potential). 5) Howard Andrew Jones’s “Crypt of Stars, From the Chronicles of Hanuvar Cabera" has one primary hero: Hanuvar of the Volani. It's him against the invading Dervani who are out to raid his ancestral cemeteries. I am a big HAJ fan, having followed his blogs and Black Gate articles and enjoyed his fiction (i.e., The Bones of the Old Ones). He never disappoints. 5-stars. 6) C.L. Werner's "There Was an Old Fat Spider” offers a biased protagonist, Karl, who may be an anti-hero. A knight and civil protector Rudolf Goettinger tracks Karl down in this Germanic/Gothic tale that reminded me of Werner's Warhammer tales. Lots of gray areas here. Good grimness. 4-stars. 7) John C. Hocking’s “The Crystal Sickle’s Harvest. From the World of the Archivist." Another police-like duo lead this mystery: Thratos (mentor Hand of the King sorcerer) and Benhus (young mentee, warrior sorcerer). Thieves are breaking into royal crypts, but not necessarily to steal. Why? Some neat Magical Weapons are presented, i.e., the Nobleman's Comfort (magical wand, and its in the Appendix). Best of all, this story has a talking skull! But is it THE skull? 5-stars. VOLUME #2 promises more of the great quality, and it is nearing publication (June 15th 2018). 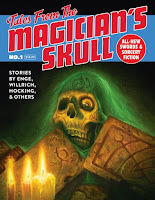 I suggest you join the Legion of the Skull, whether you like to read, play RPGs, or both. Mar-April Groupread Topic Poll. Two months, two topics, probably. Thanks to Jack, Cindy, Jordan, Al, and Richard for ideas.